19/01/14 – Added a better working version of Space Hop to site + screenshot. You all remember Reflective Designs and the various games produced and coded by Duncan Kershaw for Players, Zeppelin and Codemasters? 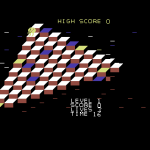 Well, we all have to start out somewhere – and Duncan first got into coding on the C64 by programming in BASIC (with a bit of machine code to mix it up). In recent years, Duncan has sorted through his work disks and found a number of his very early titles. 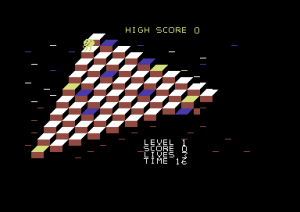 One such title he completed was a game called Space Hop, which was a Q-Bert clone done completely in BASIC. Sadly the version we had was corrupted somewhere in the compression. However, Duncan later ported a few of his old tapes and found another version of the game which pretty much works. However, it’s a bit fiddly to get going – you must load the first file in, soft reset and then load in the main game. Here there is a odd protection system in place, which can be bypassed by going into the BASIC code. At some point, we hope to get a fixed version added to the site. It is believed that the game was only shared between friends, so this is the first time really that it has been made available to the public. Electra Software we believe was Duncan’s own made up label.